It’s 7:00 pm on a Saturday night. There is a warm breeze and a blue sky. My husband and I eagerly approach an open-air tent with a smattering of tables covered with white tablecloths and a small terrarium as a centerpiece. For a moment I fear that we’ve stumbled into a private party. There are couples drinking wine and holding hands across the table, posing for pictures against the gorgeous view, or listening intently as a server describes an intriguing dish and its origins. This is our introduction to The Restaurant at Patowmack Farm in Lovettsville, Virginia. I’m enthralled before I’ve even taken a seat. 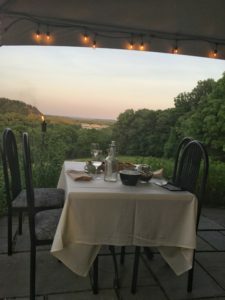 The idea at The Restaurant at Patowmack Farm is to sit back and let nature takes its course. Make that nine courses. 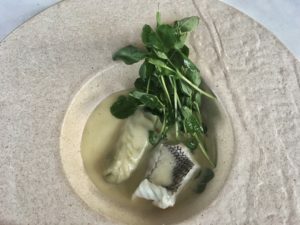 Chef Tarver King plays masterfully with ingredients that are grown organically on the farm or sourced locally, and presents them in imaginative ways that correlate to the setting. 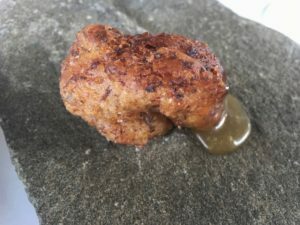 A stone slab is the vehicle for a fried donut filled with mushrooms foraged nearby. It’s served with a dab of wild honey. The donut, along with a small plate of tempura pickled ramps with chevre, comprise part of a course titled “Trading with the Piscataway Tribe.” The Piscataway Tribe actually lived on the property, where they would trade with local settlers. “This place of trade” in their language is Patowmack, which is the derivation of the restaurant name. I pause each time I refer to the restaurant, as I struggle to not say Potomac. 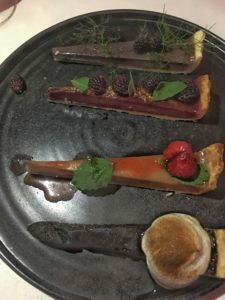 Every course is delivered with a similar informative explanation from the server, who leaves behind a slip of paper describing the origin of ingredients or something unique about the dish. A vibrant green tomato soup with curry, shrimp, yogurt, and garlic chive naan is accompanied by a justification for utilizing green tomatoes. We learn that “they have a healthy amount of malic acid, which is known to stimulate the saliva glands.” We also learn that this is the restaurant’s 22nd recipe for naan. The tasting menu includes both a fish and meat course. Fun facts: Black bass with pea shoot culurgiones is caught off the coast of Crisfield, MD by Captain Bob. Culurgiones is Sardinian for stuffed pasta. The literal translation of the word is little bundles. The delicate fish is steamed in fennel frond tea, which provides a unique fragrance. The meat course- or grilled tofu for my husband- is the most intricate and interesting. 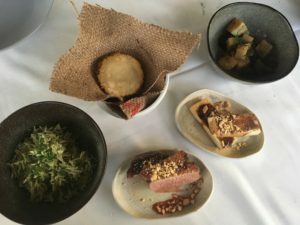 Duck breast is enhanced by chicory mole, and the accompaniments include potato and mushroom escabeche, green rice dusted in garlic, and masa flour gorditas presented on a burlap bag used for roasting coffee beans. The duck is finished at the table with a final mesquite smoking, which adds a layer to the sensory experience, and gives it a pronounced smokiness that is elevated by the slightly sweet mole. A palate cleanser of cold cherry juice with a layer of warm almond foam is presented on a hot stone dusted with anise seeds, so that the aroma becomes integral to the drink. I don’t care for the flavor, but appreciate the dramatic flair. π 4 is an assortment of custard pies, made with fruit and herbs picked fresh off the farm. Each slice is a luscious swirl of sweet, paired perfectly with an herbal accessory. Mulberry pie is topped with fennel, black raspberry with fresh sage, strawberry with balsamic and lemon balm herb, and dark chocolate with meringue and a dusting of black cocoa powder. 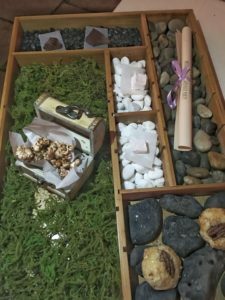 The finale is a playful shadowbox filled with delightful treats of chocolates, toffee popcorn, strawberry marshmallows, and pecan sandies. It’s refreshing to dine at a restaurant where the ambient noise emanates from nature. But there’s no need to worry about the weather. The restaurant has a lovely glass enclosed dining room. The Restaurant at Patowmack Farm stands out in a field that’s crowded with fine urban hot spots. It is perfect for a special celebration (Happy Birthday to me) or for escaping the city without travelling terribly far. Lovettsville is about an hour drive from DC. This is a place where you can revel in the natural beauty of the scenery- both in the landscape and on the plate. Very evocative, Lori! Can’t wait to go! Thanks, Rick. You should definitely make a trip!